Inspiration and insights for action in scintillating conversations with the world’s leading experts. I’m thrilled to let you know about the launch of the podcast Work and Life! Wharton and SiriusXM partnered to start Business Radio Powered by the Wharton School (Channel 111) in January 2014. Since then I’ve hosted about 200 guests on my weekly show, Work and Life , the goal of which is to provide inspiration and insights for action that empower people to create a greater sense of harmony among the different parts of their lives. Latest estimates indicate our channel reaches over 650K SiriusXM listeners throughout the U.S. and Canada. But there are many people who are not fee-paying subscribers clamoring to have access to what business leaders, researchers, policy advocates, and all kinds of thought leaders have to say on my show about how to manage the intersection between work and the rest of life. 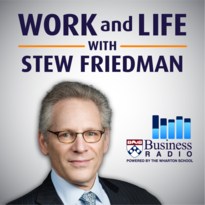 SiriusXM and Wharton recently agreed to allow hosts to share podcasts of our shows for free. So, we are now producing a weekly podcast series with edited versions of my shows supplemented by additional information about each guest. There are oldies but goodies from the vault, such as Anne Marie Slaughter, CEO of the New America Foundation, and Sam Polk, a former Wall Street hedge fund trader who traded it all to found Groceryships, which helps feed people trapped in “food ghettos.” Next week, our team will publish my recent conversation with Emily Esfahani Smith, author of the new book The Power of Meaning. I hope you’ll subscribe to the weekly podcast on your preferred platform — iTunes, Google Play, SoundCloud , or RSS feed — so you can take in wisdom and advice from world-renowned researchers (e.g., Barry Schwartz and Cal Newport), pioneers in the field of work/life (e.g., Ellen Galinsky and Joan Williams), distinguished Wharton alumni (e.g., Neil Blumenthal and Brett Hurt), CEOS and other HR execs (Doug Conant, Campbell Soup’s former CEO and Patty McCord, Netflix’s former Chief Talent Officer), and more! In the upcoming weeks, for example, I’ll be speaking with Gretchen Rubin and Arianna Huffington. The radio show is live on Tuesdays from 7 to 8 PM Eastern. I take calls from listeners in the second half, after my conversation with guests in the first half. Please take a minute now to subscribe to the weekly podcast on your preferred platform — iTunes, Google Play, SoundCloud, RSS feed — and share with your friends!